This is a view of the cow heart showing the origin of the aorta. The first several inches of the aorta have been cut (on its long axis) to open it. You can see the inside (lumen) of the aorta and where it exits the left ventricle of the heart. 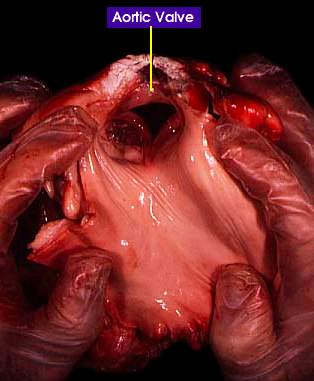 The aortic valve has three leaflets, which result in the triangular appearance of the opening when it is partly open (as it is here).